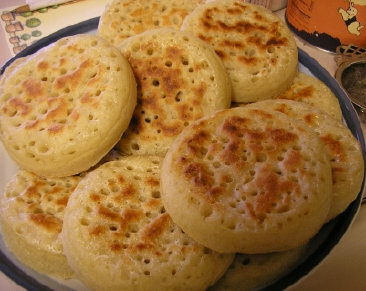 Who doesn't love crumpets, still hot and dripping with butter? 1. Heat the milk and water in a saucepan until 'hand hot'. 2. Pour into a jug and add the sugar and yeast, stir and leave in a warm place for 10 -15 minutes until there is a frothy head on it. 3. Sift the flour and salt into a bowl, make a well in the centre and when the yeast mixture is frothy, pour it all in. Use a wooden spoon to work the flour into the liquid gradually and beat well to make a smooth batter. 4. Cover the bowl with a teatowel and leave in a warm place for about 45 minutes, by which time the batter will become light and frothy. 5. To cook the crumpets, butter the insides of metal cooking rings using a knife. Spray or sprinkle a very little cooking oil on a frying pan and place it over a medium heat. When hot place the rings on the frying pan. Spoon 1 tablespoon of the mixture into each ring, so it's about 2cm thick. Cook for 4-5 minutes – bubbles will appear on the surface then they will burst to leave the characteristic holes. 6. Use tongs to lift off the rings and turn the crumpets over. Cook on the other side for just 1 minute. Repeat for remaining mixture, re-buttering the rings to prevent sticking.